perfect-chemistry/beauty and fashion blogger/london: Chocolate Chip Cupcake Recipe. So I know this isn't anything beauty or fashion related, but I thought that on my blog once in a while I'd share some of my fab *cough* not really *cough* home baking skills. Today when I got home from school I decided to make Chocolate Chip Cupcakes. Firstly measure out 150g of self raising flour, then sift it into a large bowl. Then measure 150g of butter and put it into a new large bowl. After so measure 150g of caster sugar, mix also put it into the bowl with the butter, then blend until all the sugar has mixed with the butter and is not granulated. Next you get 2 large eggs and crack them into a bowl or cup, whisk with a hand whisk till yolks have combined. After doing so bit by bit blend the egg into the butter and sugar mixture until there is no more egg to mix in. Make sure that all the egg is thoroughly mixed into. Now go back and get that flour that you've been waiting for and gradually blend it into the bowl of egg,sugar and butter, do this until there is no more flour and the mixture is creamy. Once creamy add a teaspoon of vanilla extract and mix well. Now if you're like me and forgot to buy chocolate chips then plain chocolate bars are a good alternative, the only bother is you have to take the extra time to cut it up into small chip like chucks, once you have done so add the chocolate chips into the cupcake mixture and stir the chips in until you are satisfied they are equally spread out. 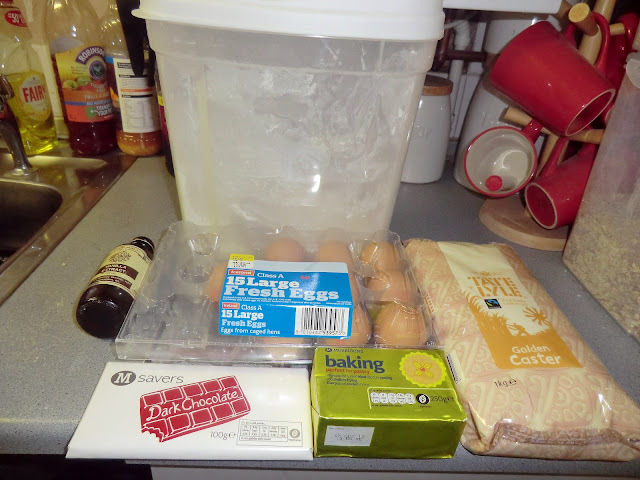 Then you add even amounts of the cupcake mixture into a baking tray of cases, which will then be put into the oven for 20-25 minutes at 180 degrees celsius/ Gas Mark 4. In this time you can do all the washing up as there will be a little bit to do! And now the moment we've all been waiting for, the end result, when they are finally edible! The best way to best this is to get a fork and poke it through and nothing comes out of it and they look slightly golden on the tops. Personally I'm quite impressed with the results of my cupcakes, they may not look 5 star quality but they taste dam good! haah whenever i look at recipe post's i get hungry! Such a good post, now i'm off to make some chocolate chip cupcakes!! Ooh these look tasty! I'll definitely try these out, perhaps with a thick creamy chocolate icing on top of them! yam yam! :) nice idea!